Artists from around the country will be in Cloudcroft for Mayfair at Zenith park Saturday and Sunday from 10am to 5pm. Click on the link for the Mayfair Flyer. 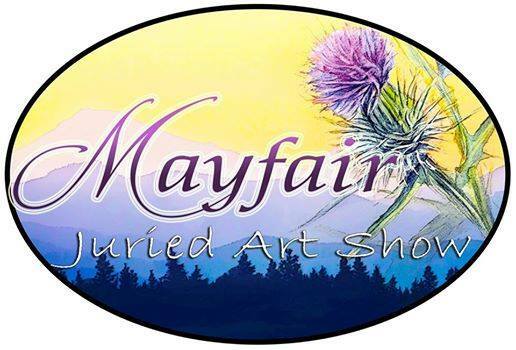 Book your room now for the 47th Annual Mayfair Juried Art Show. Live music, food, and fun for the whole family. Artwork, Sculptures, Jewelry, Pottery and much more. Come to Cloudcroft to enjoy the Art Show and visit our wonderful Village! Great weather, live entertainment, food and fun are waiting for YOU. Shopping, Lodging, Dining, Recreation–ALL in Cloudcroft! This year’s Mayfair will have many new art vendors and booths for the kids and while you’re here–make sure you visit Historic Burro Avenue for more shopping and food for the whole family! At 7:30 pm there will be a melodrama performed by the Cloudcroft Light Opera Company in the Zenith Park Pavilion.